Necklift is essentially the foundation of “facelift” or "rhyditectomy" in cosmetic surgery. The neck is a major anatomic area that surgeons address when a patient wants facial rejuvenation. 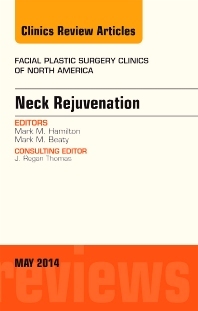 This issue of Facial Plastic Surgery Clinics focuses solely on Necklift. Every facial platic surgeon and plastic surgeon, along with dermatologists and other cosmetic specialists who work in facial rejuvenation will benefit from the information presented on neck lift techniques, less invasive and minimally invasive procedures, and tips from expert surgeons who work on the aging face. Videos showing technique accompany many of the articles, topics of which include: Anatomy and Physiology of the Aging Neck; Pre-operative Evaluation of the Aging Neck Patient; A Systematic Approach to Neck Rejuvenation; Non-Surgical Neck Tightening Treatments; Neck Skin Rejuvenation; Minimally Invasive Approaches to Neck Rejuvenation; Techniques for Rejuvenation of the Neck Platysma; The Extended SMAS Approach to Neck Rejuvenation; The Deep Plane Approach to Neck Rejuvenation; Vertical Neck Rejuvenation; Adjunctive Procedures to Neck Rejuvenation; Complications and Sequelae of Neck Rejuvenation.